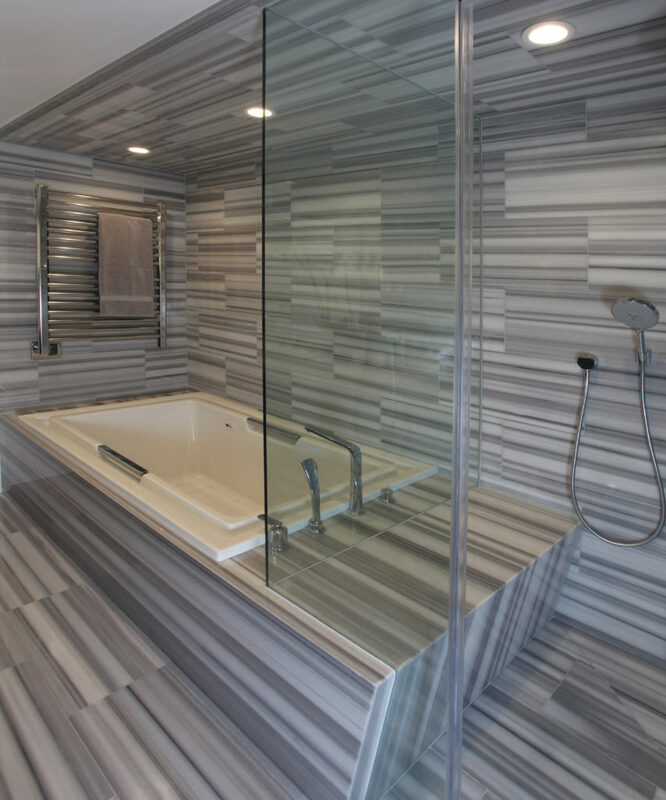 According to Google, the number of people searching for “grey bathroom” has doubled since 2012, with an unprecedented rise in popularity among home owners, renovators, and interior designers – but why are grey bathrooms so in demand? “Grey is trending everywhere, from bathrooms and living spaces to people’s hair. I love a good grey palette. It’s a nice neutral tone that adds a sophisticated, modern feel to the bathroom. 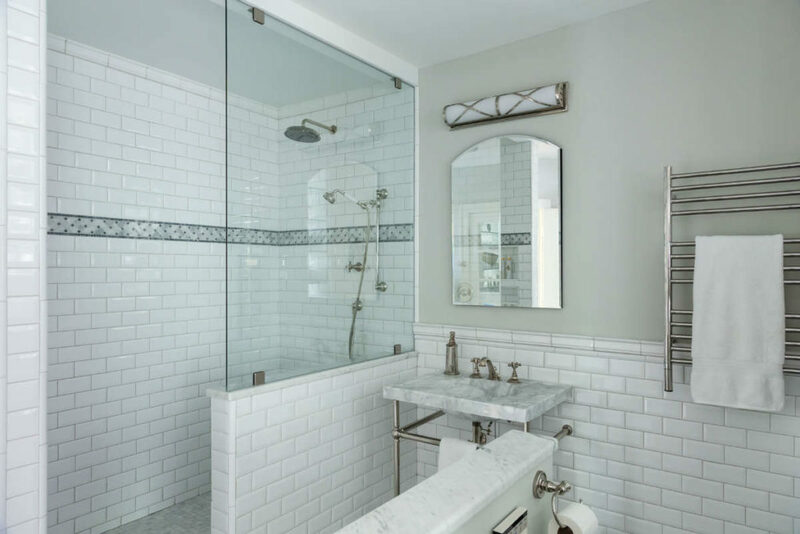 I think a lot of designers are moving toward grey because it helps to open up tight spaces like bathrooms without going sterile with a full white room. When we talk about grey, it’s easy to picture drab concrete, boring office buildings, and dull, nondescript décor – but a neutral tone bathroom can make a captivating colour scheme to add a touch of sophistication to your home. The example below from Arch Interiors really demonstrates the potential of a grey bathroom, using impactful tiles with an inventive pattern to create a unique, futuristic aesthetic. 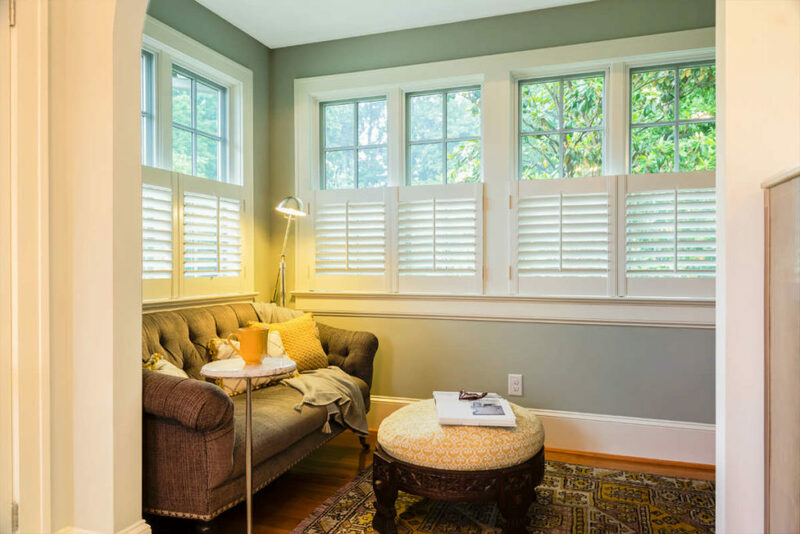 “Grey can be a really soothing shade when paired with the right hues. Most palettes work well with grey, but stick to one or two colours. Learn how to layer greys for a calming effect, or combine them with other colours to add extra punch to your design scheme. While sky blue, off-white, and natural tones are all popular choices for a bathroom hue, grey provides a balance and neutrality that can give your space a calming, sophisticated feel. Another benefit of a neutral shade bathroom is the possibility of changing your accent colour more often – if all your fittings are grey and white, you can change the accompanying colour of your walls, towels, and storage options more frequently, while retaining the spirit of the room (not to mention saving money by avoiding a complete refurb!). We caught up with Carole Marcotte from Form and Function, a sustainable, vintage-inspired interior design brand who provided the below images from a recent project. The bathroom is split into a spa-like bathing area and a den complete with sofa and TV to act as a peaceful escape from the rest of the busy home. 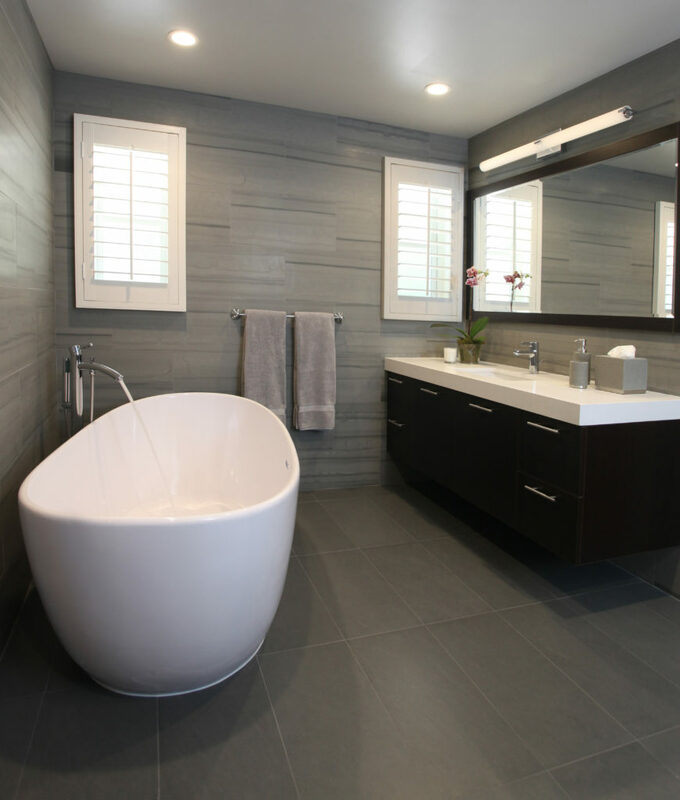 This grey bathroom design is paired with retro style tiles to give a classic, sleek aesthetic. Many grey bathrooms opt for contemporary style, but we think this combination of grey with vintage fixtures works well together. The den area of the bathroom (above) features a warm grey that works well with bright accent colours, such as a vibrant rug and yellow throw cushions. 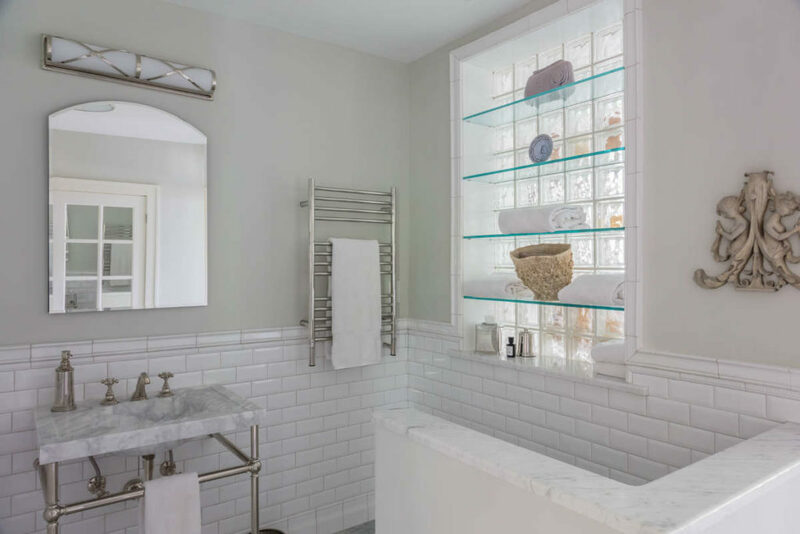 Accenting a light or dark grey bathroom with clean white accessories – such as towels – can lighten the mood of the room and prevent it from feeling dreary or plain. To keep your style uniform, it’s worth investing in bathroom accessories which complement the overall mood and colour scheme of the room. 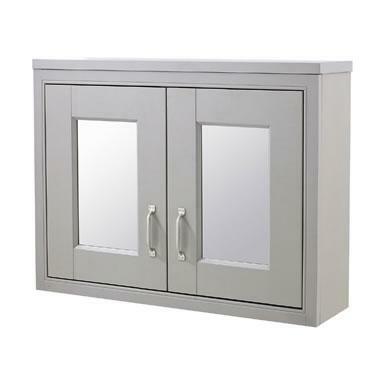 For example, a mirrored cabinet in a light shade, like the old London grey mirror cabinet pictured above, is neutral and unassuming, but offers subtle hints of traditional style. A grey slate shower tray can give your space some gravitas, creating an impactful focal point in an often overlooked area of your bathroom. Another excellent piece to include in a grey bathroom is a vanity unit to enhance a contemporary or heritage inspired décor. 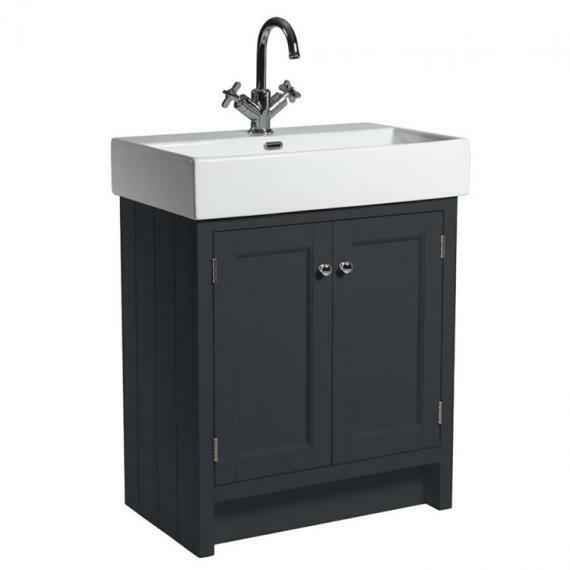 A dark grey vanity unit like the piece pictured above can be a nice touch, as it adds valuable storage space while contributing to your overall theme. Grey is versatile enough to suit a traditional décor or a sleek, modern design, so the choice of accessories is vast. 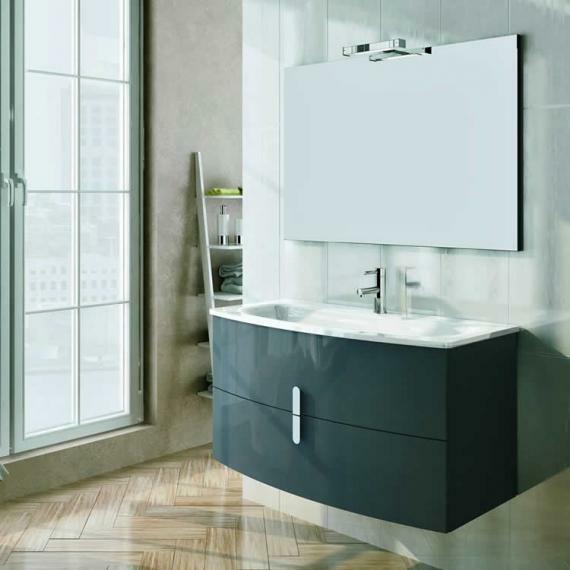 For example, the gloss vanity basin below would suit a minimal layout, while being easy to clean and maintain.